With only six entries it still proved to be a very entertaining racing. The over cast skies soon cleared to give a bright sunny day. With the wind coming from ENE force two. This required some course changes by the race team of John Coster and Geoff Appleton. Racing started with the pattern for the day soon forming with Vernon Appleton of the home club and Ken Binks contesting the lead. Paul Wilson of Eastbourne finding himself in third place for most of the day. 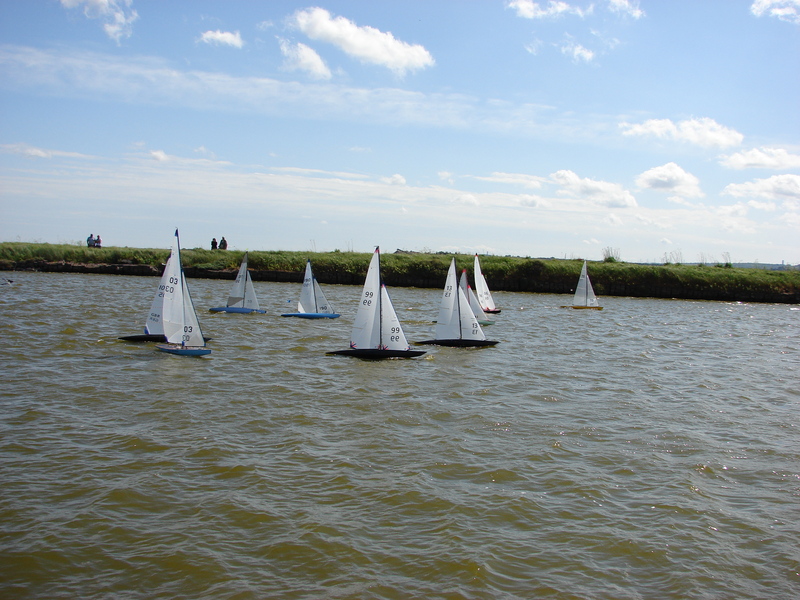 Fourth and fifth places were contested by Alan Oxlade and Joe Binks with some close racing. Lester Gilbert entered but was unable to sail. As can be seen from the results the last race counted for the series as Vernon and Trevor were tied on fourteen. It was time to consult the Sailing Instructions to find the winner. Vernon had won by winning the last race. It would have been better to hold an odd number of races then it would have been decided on the water. Just for a nice change the wind direction was ideal for the lake, the sun shone and the threatened rain didn’t arrive. Course Setter Graham Childs used a long thin triangle and sausage for a few races then set a rectangular course to be sailed twice. Perhaps straight up and down with spreaders at both ends is a better description. 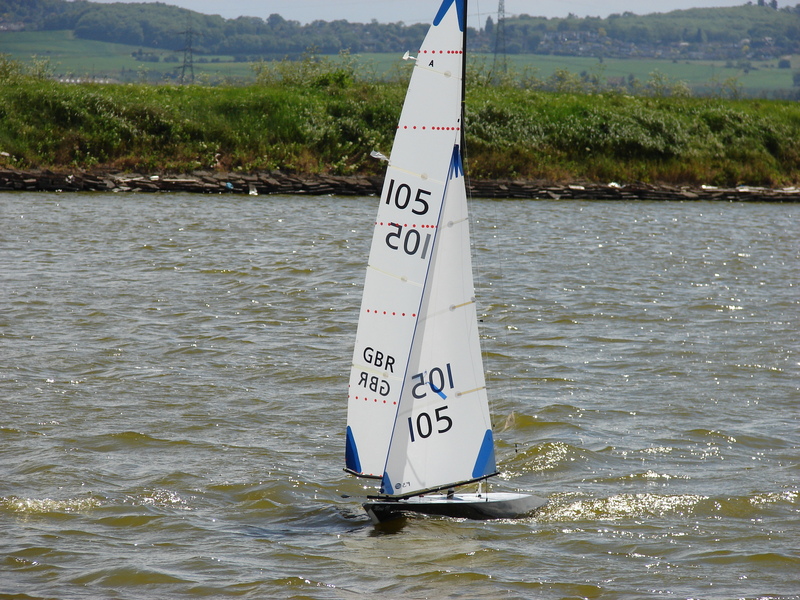 However as the lake is relatively narrow he then omitted the spreader buoy at the leeward end on the second lap to give some options for the beat to the finish line. For all races the combined start and finish line was midway up/down the length of the course. Race Officer Geoff Appleton decided to have an initial single race then pairs of races for the rest of the day and it worked very well. Vernon Appleton sailing his brand new Sword for the first time got off to an excellent start and looked set to win the first race only to be outsmarted by Dave Andrews on the last beat. Colin Trower and Lester Gilbert were not far behind. Darin Ballington found himself on the same frequency as another boat so started well after the rest of the fleet. It turned out to be a Race Committee error for which he got redress and that was the only incident that needed a Committee to deal with. Not that there were no others but all were settled amicably without the need for committee decisions. Races 2 was won comfortably by Colin with Dave Munro taking second place with once again Lester and Dave Andrews not far away. Race 3 saw Colin again in front with Lester as runner up, Darin getting into his stride third and Vernon fourth. And so it continue with those already mentioned taking the top places in the races up to lunch after race 6. At this point Colin was ahead with a net 8 points with Dave Andrews on 11 and Lester on 13. Darin had 20.6 and Vernon 25 with both no doubt looking forward to the second discard! The wind had been strong with gusts peaking to 20 mph at times. That caused some to changed to second suits, or at least to second mains, at lunch time though those that didn’t seemed to cope well most of the time. It began to look as if the wind had dropped somewhat once the boats were back on the water but then it picked up and there were a few hairy moments for some. There were some exciting sights with boat racing downwind with spray flying from them. With Colin at or near the front of all races up to race 7, it began to look like a repeat of last year’s event, which he won. However it was not to be quite like that. He suffered a winch failure with probably a stripped gear which put him right out of the running. Vernon now got into his stride, having missed a couple of races with water in the radio pot, to give Dave Andrews a fight and Lester too was almost always close. At times Darin got among them but not quite well enough though it kept them on their toes and he did win one race. Those four were always at the front and quite often the lead changed a few times in a race. A few other ‘interlopers’ got near the front at times but never managed to stay there to the end of the race. There were numerous problems with boats (I counted 8 but probably missed a few) and though some recovered we eventually lost 5 boats from the fleet. The strong winds caused some to get water into wrong places like the radio pot and seemed to be the commonest cause. Others had flat batteries and rig breakages. At the end though with consistent sailing Dave Andrews won the event with Vernon and Lester some way behind but close together for the 2nd and 3rd. Darin’s 4th was again as a result of consistently being there albeit a little behind. This was an event of three parts. It was the first time the Apples Trophy had been seen and competed for. It is a nicely turned representation of an apple on a wooden base made, and presented to Dave Andrews, by Geoff Appleton. It was also the Eastern District A Class Championship which is open only to members of Eastern District Clubs. As the only ED skipper with a boat having a valid certificate the trophy went to Rick Buxton. The rules allow a boat without a certificate to sail but not to take the trophy, so Vernon was able to sail despite having no certificate. PRACC rules on the other hand permit a boat that has been measured to get PRACC points while awaiting its certificate. The guy who measured Vernon’s boat happened to be there to confirm the fact so Vernon gets his PRACC points! In due course David Munro will no doubt update the PRACC table.